• Use a pitch controlled tapping attachment. • Choose the correct lubricant (Choose – Ultra S/P ™ Super Premium). • Use the correct tapping drill size and type of tap. • Choose the correct Speeds and Feeds. • Keeping taps sharp, check tap for wear. • Check hardness of material, especially when changing batches of material. • Lubricant is Poor or Flow is Restricted. • Bottom lead or Spiral flute taps are used. • Thread depth ( % ) increase. • Thread pitch is course. 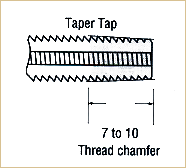 • Cutting taper threads (50% Normal Speed). • Thread Pitch is fine. • Coolant flow and Quality is Good. • Spiral point taps are used. Proper tapping speeds are very important in obtaining efficient tapping results. The optimum speed for tapping is highest speed that conditions permit, consistent with acceptable tool life. Speeds must be reduced as length of hole increases. Holes, taps with tapered chamfers are able to operate faster than taps with bottoming chamfers. Vertical tapping speeds can be increased, compared to horizontal tapping. Recommended Feeds and Speeds table below suggests a "starting point" for selecting the speed to operate the tap. Straight flute are general purpose tools to be used for hand tapping. They are generally the most economical tool for use on production runs, but are best on materials that produce chips, or where the swarf breaks readily. Seven to ten threads chamfered for easy thread starting in tough materials. 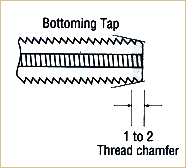 One to two threads chamfered to use after threads have been started for tapping to the bottom of a hole. Easier and faster assembly, providing a better start with less chance of cross threading. Nicks and burrs from handling are less liable to affect assembly. They are less likely to seize in temperature applications and in joints where corrosion will form. Less prone to strip when threaded into lower strength metals. More easily tapped in brittle materials and or materials that crumble easily. Fine threads may make for superior fastener for applications with specific strength or other requirements. They are about 10% stronger than Coarse threads due to their greater cross-section areas. 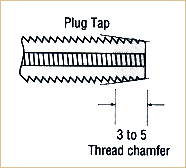 In very hard materials, Fine threads are easier to tap. They can adjusted more precisely because of their smaller helix angle. Where length if engagement is limited, they provide greater strength. Thinner wall thickness can be used because of their smaller thread cross section.